An applicant who fails to meet vision standards and has no SODA that covers the extent of the visual acuity defect found on examination may obtain further FAA consideration for grant of an Authorization under the special issuance section of part 67 (14 CFR 67.401) for medical certification by submitting a report of an eye evaluation. The AME can help to expedite the review procedure by forwarding a copy of FAA Form 8500-7, Report of Eye Evaluation, that has been completed by an eye specialist (optometrist or ophthmologist) 24. Applicants who do not meet the visual standards should be referred to a specialist for evaluation. Applicants with visual acuity or ocular muscle balance problems may be referred to an eye specialist of the applicant's choice. The FAA Form 8500-7, Report of Eye Evaluation, should be provided to the specialist by the AME. 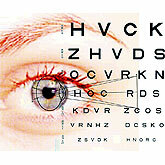 24 In obtaining special eye evaluations in respect to the airman medical certification program or the air traffic controller health program, reports from an eye specialist are acceptable when the condition being evaluated relates to a determination of visual acuity, refractive error, or mechanical function of the eye. The FAA Form 8500-7, Report of Eye Evaluation, is a form that is designed for use by either optometrists or ophthalmologists. Valid for Student Pilot Privileges Only.